Crwys wrote it. Now the words decay. Come, seals! Take his grinding wheel away. And queues in the sluice by an open door. Like leavened loaves with spiral eyes. With influx from Rhos Dirion’s brow. 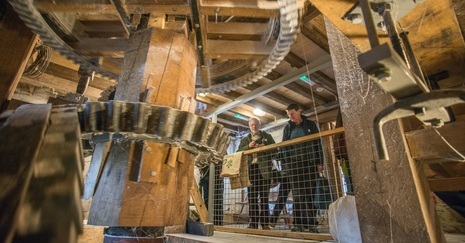 In May 2011 an old ruined water mill in the town of Talgarth in Brycheiniog was renovated after sixty years of neglect. With financial support from a range of sources, a community venture succeeded in reviving the mill and adding to it an eco-friendly café and a bustling bakery. The wheel turns with water from river Ellywe, which was presumably named after Ellyw, patron saint of Llanellyw in the hills east of Talgarth (or vice versa). The source of the river lies in an area of moorland in the Black Mountains called Rhos Dirion. This poem (written at the request of the architects) is an English adaptation of a Welsh poem commissioned by the National Eisteddfod in Carmarthenshire, 2014. Whereas commissioning responses by a resident poet to the art pieces at the Eisteddfod is now a well-established tradition, this was the first year a poet was appointed in connection with the prize for architecture. I composed the original poem following a visit to the mill at Talgarth (designed by Hoole and Walmsley Architects), where I received a warm welcome and met a number of people who work there (many of whom do so voluntarily). Their community spirit moved me to include their names in the poem. The most famous mill in the Welsh language is the ruined mill of Tre-fin, about which Crwys (1875-1968) wrote a well-known and rather sentimental poem whose dreary influence must surely now, by way of the success of Talgarth Mill, be much diminished!